Today we proudly present! 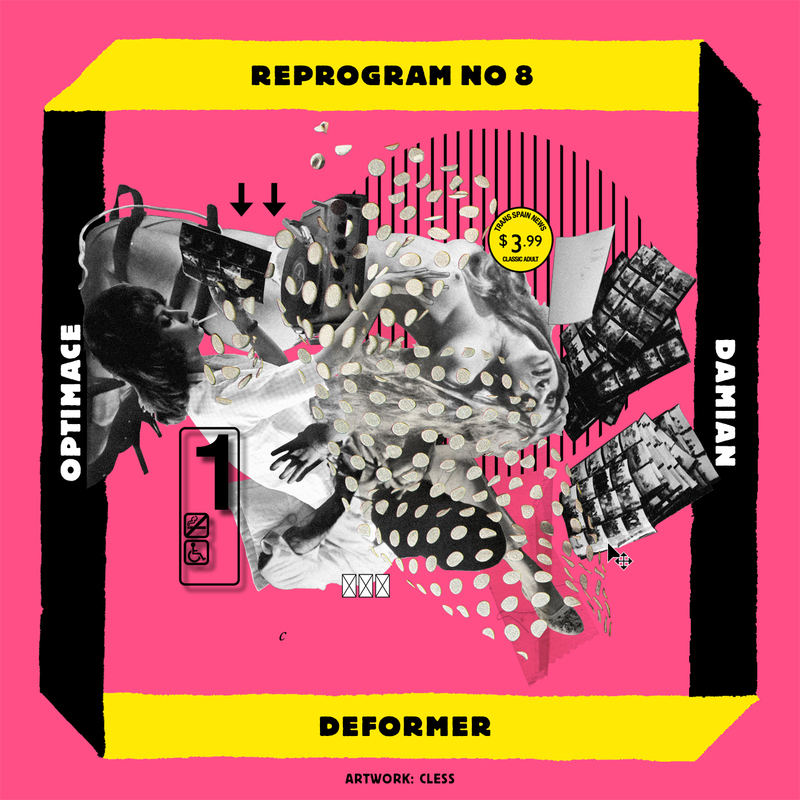 The eighth track release of the remix-artwork project ‘REPROGRAM: A SEQUENCE OF REMIXES’: Deformer remixed ‘Damian’ by OptiMace and Cless provided the artwork. ‘Damian’ was released in 2011 on the Used Future EP by OptiMace ft Erwin Vann on saxophone & fx. OptiMace is the result of an intensive musical cooperation between DJ’s Mace and Optimus, both initiators of Dutch recordlabel Fremdtunes. Their music consists of abstract jazz-licks, sample-based soundscapes, boombapdrumpatterns and vintage synthstrains. Mike Redman a.k.a. Deformer remixed the track and turned it in to a bass-loaded, junglistic breakbeatfrenzy. Mike, from Rotterdam City, pushes musical boundaries since the early 90’s as one of the frontrunners of Dutch Jungle music. The sound of Deformer fuses different genres into a venomous blend of electronic mayhem, from Breakcore to any core possible. Deformer has collaborated with hiphop giants Public Enemy, killed renowned festivals like Outlook and Lowlands and served the international underground scene along the way. Deformer released on Mike Redman’s own label Redrum Recordz as well as Clash, Mindtrick, PRSPCT etc. The remix is mastered by Collin Visser. The artwork is provided by Cless. “Graffiti doesn’t make your life worse. It just makes your neighborhood look better”. Cless too. When you look at his art you feel that stupid thing of “I could do this myself”. He achieves to make it look like something easy though is not. Superposition and fusion of the images help to obtain his very personal quest. Always looking, chasing and finding, he has entered a personal world in occasions self-referencing and another universal, using sometimes his own languages codes and some others appropriated or borrowed. 27. Cless enters the world of art the way it should be, without wanting it, as a consequence of personal work that forces to follow always forward: combining the forbidden and public world of the New Yorkers Wild Style on abandoned walls with the private world of his own obsession. Todo Vale. The visual saturation & wastage that he uses as the raw material is a skilled sewing exercise embroidered without a template.” (Text by Rubén B).